Pileje Arthrobiane is a dietary supplement containing chondroitin and glucosamine sulfate. 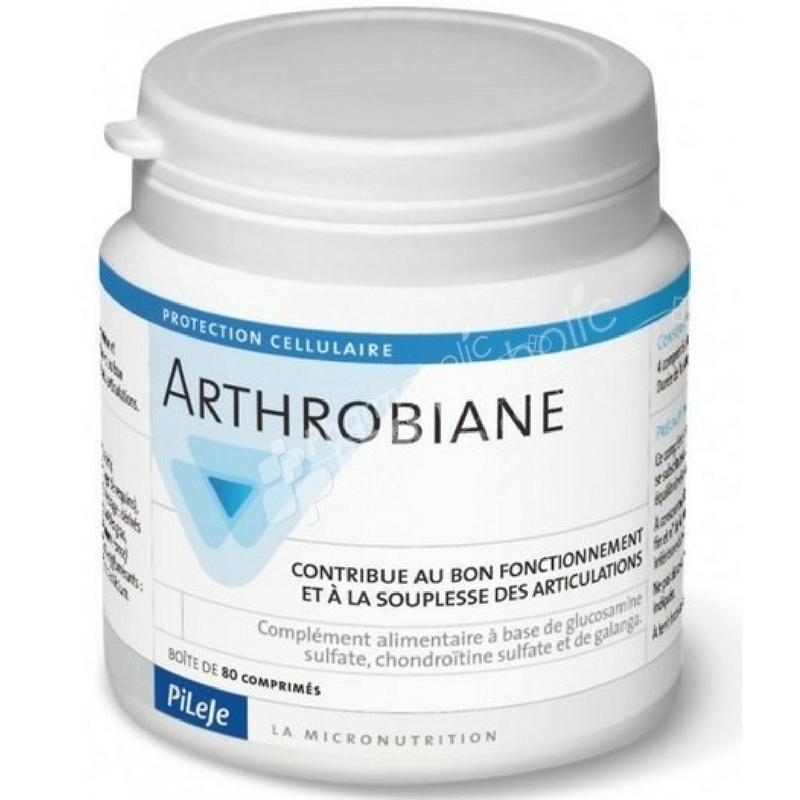 Arthrobiane consists of 1200 mg of glucosamine sulfate & chondroitin sulfate 800 mg derived from natural ingredients. Chondroitin sulfate: A sulfated carbohydrate that occurs naturally in cartilage ray or shark as to approximately 15%. Specifically these are wild species and unprotected Prionace glauca , Alopias vulpinus and Sphyrna zygaena , what extracted the chrondoïtine sulfate used in Arthrobiane tablets. Glucosamine sulfate: A naturally occurring substance in the body, is the main precursor of the essential components of cartilage. Arthrobiane The glucosamine sulfate is extracted from chitin found in the shells of shellfish: shrimp ( Penaeus mergu iensis or Penaeus indicus , Penaeidae, Natantia ) and wild lobsters ( Panulirus stimpsoni ) non-GMO. Glucosamine sulfate (origin crustaceans ), chondroitin sulfate (marine ( fish )), bulking agent: microcrystalline cellulose, coating agents: hydroxypropyl methylcellulose, microcrystalline cellulose, and acetate esters of mono and diglycerides of fatty acids, galangal extract Alpinia offi cinarum Hance (root), anti-caking agent: magnesium stearate and silicon dioxide.